The Battle of the Bands found a new home this year and somehow that sponsor clash worked itself out. 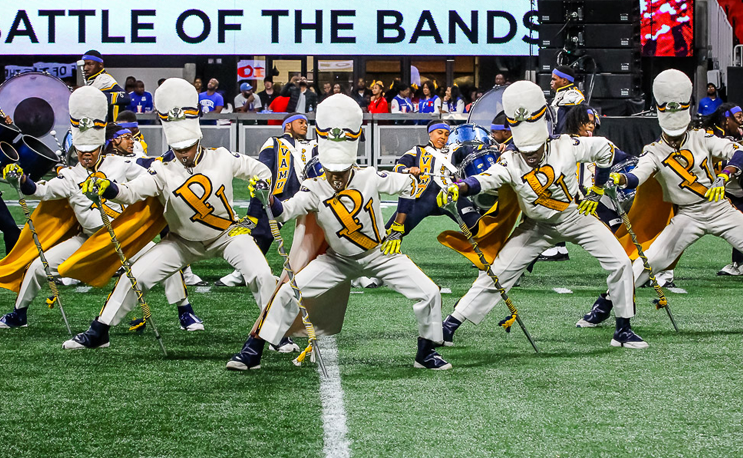 The Honda Battle of the Bands pulled into the Mercedes-Benz Stadium in Atlanta this year. The future of the HBOB in Atlanta is uncertain at best. The annual event will have to find a new home for 2019 because Atlanta will be hosting the Super Bowl. Stay tuned for more details. For now, our band photographer extraordinaire Vincent Myers has all of the action for you to enjoy. The group 112 performed at this year’s Battle of the Bands. No word on if room 112 is still where the players dwell. The Mighty Marching Hornets and Dr. James B. Oliver were back at it again. The Marching Maroon and White came down from “The Hill” to the “A.” The band is under the direction of Mr. Carlton J. Wright. The Marching Wildcats brought the heat to Georgia up from Florida. Mr. Donovan Wells has 300 strong on the field this year. Making its first appearance ever in the HBOB is the Marching Force of Hampton University. Dr. Thomas Jones and his crew will bring a dose of flavor to the Big South Conference in the years to come. No musical performance is complete without the fans to enjoy it and feel the rhythm. Some people lost themselves in the moment, which is all good. The Purple Marching Machine from Miles College rolled into the ATL behind Mr. Willie J. Snipes Jr. The PMM literally took the folks to church on Saturday. The Blue & Gold Marching Machine is no stranger to the Honda and they were back again this weekend. Dr. Kenneth Ruff led the charge down I-85 from Greensboro to Atlanta. The roof was closed but there was still a storm inside of the Mercedes-Benz Stadium on Saturday. Dr. Timmey Zachery led the Marching Storm of Prairie View A&M into the Battle of the Bands. AOB, the Aristocrat of Bands, made the short jump from Nashville to Atlanta for the Battle of the Bands. Dr. Reginald A. McDonald and his crew jumped right into the action from the very beginning.